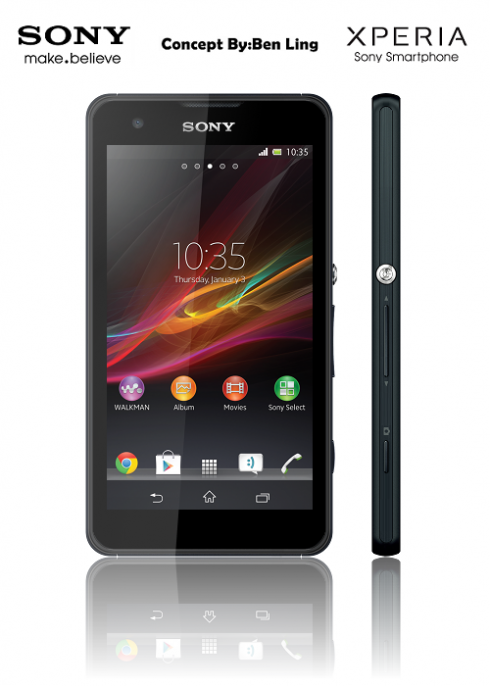 The Sony Xperia UX is a concept created by Ben Ling and its specs sound like 2014 midrange material. The handset packs a 4.3 inch HD screen with Triluminos display technology and this tech was already spotted on a recent Sony Vaio Duo device unveiled at Computex 2013. The Xperia UX uses Gorilla Glass 3 technology with shatter proof abilities, a 13 megapixel camera with LED flash and HDR and also an Exmors RS sensor for mobile. There’s dust and water proofing and the back camera does 16x digital zoom. This Xperia concept also incorporates a 2.2 MP front camera with HDR and 1080p capture, a quad core Snapdragon 400 CPU and a removable battery. It has PlayStation certification, uses an Adreno 305 GPU and all of that is crammed inside a 7.5 mm thick shell. The phone weighs 125 grams, packs in 2 GB of RAM, 4G LTE connectivity and Android 4.2.2 Jelly Bean. We’ve also got Sony Mobile Bravia Engine 2 technology, glove input support, Sony White Magic technology, xLOUD experience and a Li-Ion 2500 mAh battery. What do you think? Will MediaTek’s quad core CPU be a popular option for future midranges or the Snapdragon 400?